Due to its popularity, this post is regularly updated for better organization and to reflect new brands and styles. Last update: November 26, 2018. 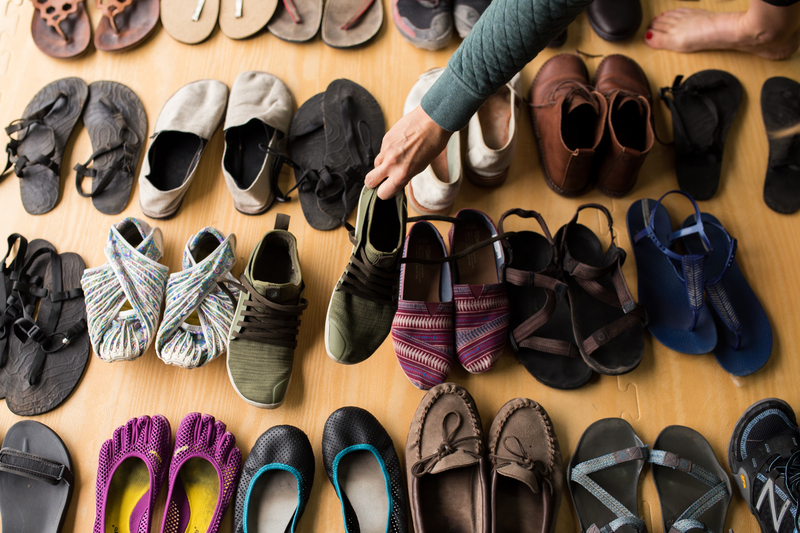 This list of minimal shoes below is in no way comprehensive, but a great starting point generated over years by our strong feet fans and readers. You'll find adult and children's footwear brands listed below and if you're looking specifically for winter or summer you can find quick lists for boots and sandals lists below the main list.You can also find additional information about footwear and children's feet here. For all the science on feet and movement, I'll refer you to Simple Steps to Foot Pain Relief: The New Science of Healthy Feet and Whole Body Barefoot. What I will say here is that "healthy footwear” is only half of the equation. The other half is movements that help you undo your adaptations to a lifetime of wearing stiff and heeled shoes, lots of sitting, and not very much walking. There you’ll also learn that footwear changes, for many people, need to be gradual. For example, after years of wearing comfortable slide on shoes (shoes that require toe-gripping to stay on), switching to footwear that’s fully connected and an inch closer to the ground uses your body in a different way. If you're doing 10,000 steps a day, that's 10,000 tiny new exercises a day—of a lot of different parts. The geometry of every shoe has a unique and profound affect on every joint in the body, as incredible as that seems. When you change shoes, it’s all about physiological adaptation. Like any new exercise program, proceed with awareness—and lots of work on your end, of course. 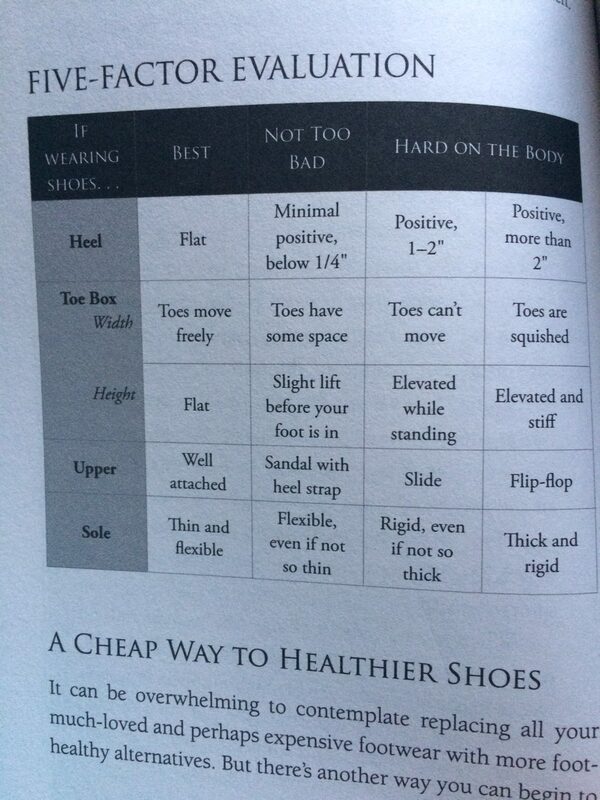 Below is a table (from Simple Steps) that shows the variables of a shoe that affect the movement of the body. You can see that there are many ways to progress to the “best” column. There’s no need to transition all five variables at once, especially if you’ve been living in the right-hand column for the last 20, 30, or 40 years—but you do need to be doing exercises to slowly wake up smaller muscles that have been sedentary for a long time. Only changing your footwear can cause an overload to underused tissues and this is about feeling good using your body, remember? Below are minimal footwear brands--brands that define themselves as minimal footwear companies. Their entire line meets the guidelines in my books. 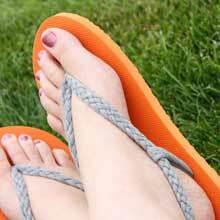 There are also companies that have styles that are more minimal or have elements of a minimal shoe. You'll find that list below this one. I've also added an asterisk* next to the brands/styles that are more work-friendly (although entirely subjective based on where you work) for those that ask "what about shoes for the office". Sanuk - casual, slip on, sandal, vacation style. Look for their fully connected options. Something specific for just the littles, but again, I'll also throw out there that I've found a ton of off/no-brand leather or soft-material shoes at kid-consignment shops over the last year. And, that for the first year all I used was a double pair of socks on my little (when it's cold - still meet all the "healthy shoe" criteria!). So don't feel that you need to get a shoe on right away or anything. There are also some people selling handmade shoes on Etsy. Go there and search "minimal and/or handmade shoes," or add "kids" if you need something for wee feet! Read more about how to size and shop for kids' shoes here! 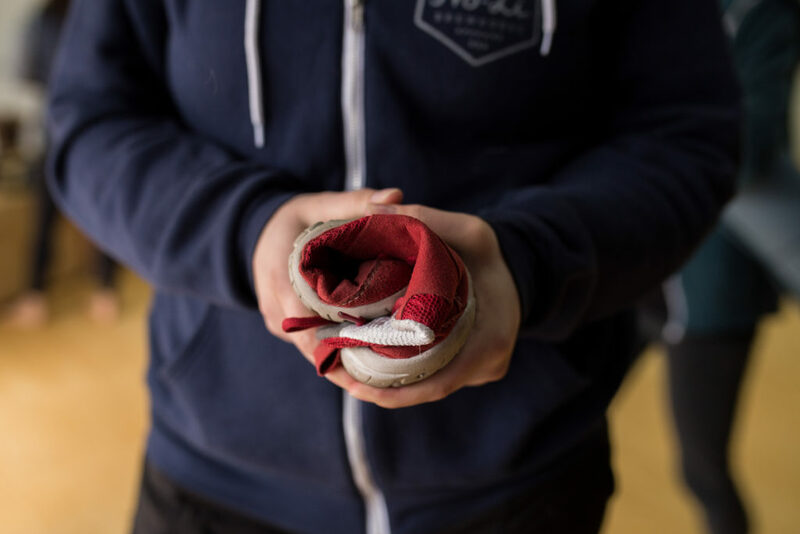 The upside of minimal shoes is that you can totally make them for your entire family if you're so inclined, which means that this transition can be less expensive and better for the environment, especially if you use natural fibers/materials. Softstar Shoes Phoenix Boots—These are comfortable and the sheepskin lining makes them very warm. They come in kid and adult sizes. Manitobah Mukluks—Now with waterproof versions, these have kid and adult sizes. These boots are heavily recommended by our friends dealing with -40 weather. Minnetonkas—Not waterproof, but they dry out well by the fire and with wool socks I can wear them comfortably in PNW snow (i.e. not bitter cold). LL Bean “Wicked Good” Lodge Boots. A friend in Tahoe treats hers with beeswax and they work well for her in the snow. MyMayu: With liners, these work for kids as winter boots.